In 2017, Inspector Fiona Lieutier’s ESCAD team will deliver a $17 million project that will revolutionise the way emergency resources are deployed to incidents. The Emergency Services ComputerAided Dispatch (ESCAD) Project is implementing a new integrated dispatch system across Tasmania Police, Tasmania Fire Service, State Emergency Service and Ambulance Tasmania. ESCAD will provide the capability to deliver the best possible response to emergencies and calls for assistance, with enhanced safety for the community and emergency services personnel. It’s the biggest project of Fiona’s career and a far cry from a posting to the Hobart Radio Room early in her career. 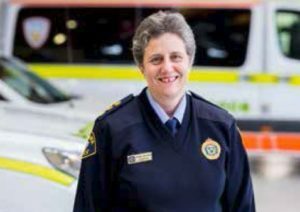 Fiona is Tasmania’s longest serving female Inspector; she graduated in 1985 and has served in the three geographic regions in both urban and rural areas. As a Constable on the beat, Fiona recalls kicking off her court shoes to chase an offender in stockinged feet as women weren’t issued with lace-up shoes. “Changes to uniform, flexibility and family friendly policies have made a career in policing much more attractive to women,” she said. “After I had my first child I returned to work full-time after three months, there was no part-time option. By the time I had my second child, part-time was available for up to 12 months,” said Inspector Fiona. at her house to look after her two boys. Her sons would sometimes have dinner at the Academy and camp in her room at weekends. Reflecting on her career, Fiona is most proud of her work as a liaison officer with the LGBTI and multicultural communities and the implementation of the “Racism. It Stops With Me.” campaign across the emergency services. “We’ve seen a significant cultural change for the better over the years,” she said. 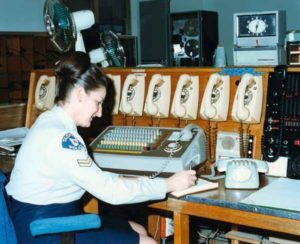 Above left: The ESCAD project is a far cry from the old Hobart Radio Room, Constable Marion Hays in the mid 1980s. Above right: Inspector Fiona Lieutier. This page -- https://www.police.tas.gov.au/about-us/100-years-women-policing-tasmania-police/agents-of-change/longest-serving-female-inspector/ -- was last published on January 17, 2018 by the Department of Police, Fire and Emergency Management.